Our Saint Helens Cabin is a newly constructed, 1036 square feet fully furnished, beautiful A-frame representing the quintessential style of vacation homes. 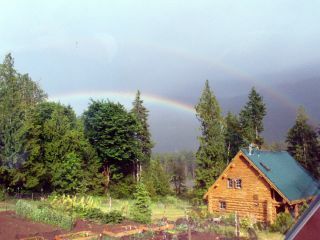 Our Mt Adams Chalet is our newest built 1400 square foot cedar cabin which became available July 16, 2009. This cabin features 3 bedrooms, 1 1/2 bath and also overlooks the Cowlitz River. Our Rainier Log House is a newly added 1500 square foot custom crafted cabin situated only 170 feet from the Cowlitz River. Our Tatoosh Tipi is camping at its finest! Come and enjoy an experience of a lifetime in this beautiful and private 22’ diameter tipi hand painted the native Ceremonial design. Outside and a few feet steps away is your private bath house complete with shower, toilet and sink. Your stay at the Tatoosh Tipi will truly be a special vacation! Come and enjoy a camping experience of a lifetime! All our vacation rentals are completely stocked and meticulously furnished and decorated with each having their own private hot tub. No matter which one you choose, you will be delighted to be vacationing in the finest. Our cabins are completely stocked with everything you'll need to enjoy your stay. Simply bring your food, your family, or that special someone! Visit our Cowlitz River Cabins in Packwood, Washington. The recreational possibilities here are endless and include skiing, snowboarding, hiking, river rafting, fishing, or just relaxing in the hot tub or skipping rocks on the river. Please browse through our website to learn more about our luxury vacation rentals and the magnificent country surrounding us. Be sure not to skip the photo gallery!